I'm looking for a boat called Krazy Bull . Heard a rumour it's in NZ and possibly for sale ?? we we thought we had the only Bull 7000 left in NZ but would love to be proven wrong . 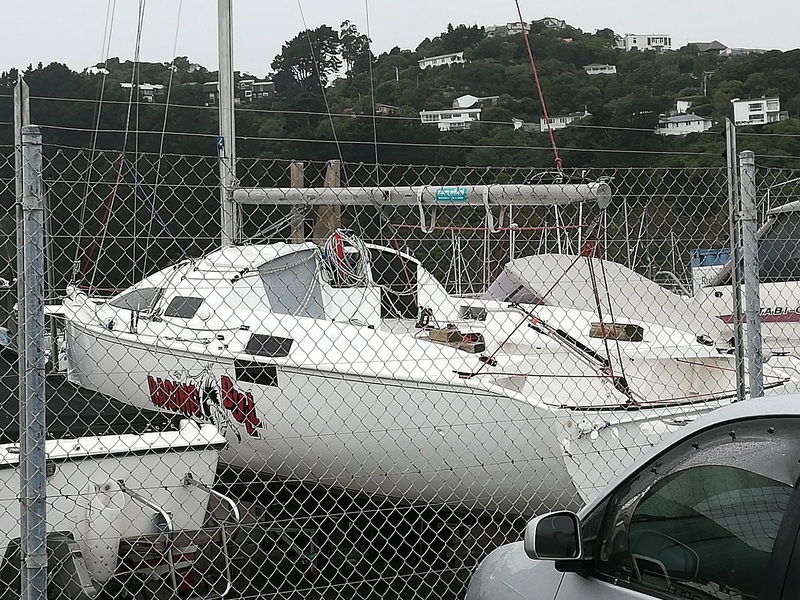 last known location was east coast of US when it was for sale in 2007 , any info on this boat or any other Bull 7000s in NZ would be greatly appreciated . Pretty sure I saw something with a name like that in the trailer compound at Seaview Marina yesterday. Don't think it's been there too long. where is Seaview marina ? I've seen "Raging Bull" (?) at Seaview (in Wellington, NZ). I don't know any details about it though sorry. Ah, it turns out Raging Bull is a Young 6.5, not a 7000. "The Young 6.5 was the first yacht designed and built by Greg Young after winning a yacht design competition. We also believe it was the worlds first pivoting bow spirit design to be built (later called the “Bullsprit”). 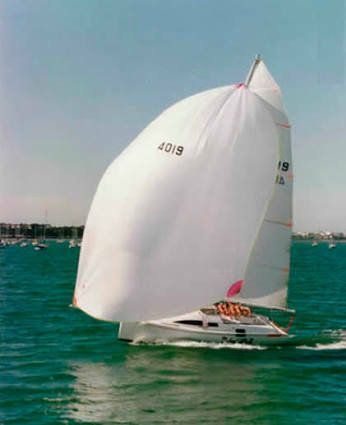 In the late 80’s many of the dinghy classes were ditching spinnaker poles for asymmetric spinnakers flown from bowsprits which were a huge step forward and the Young 6.5 was one of the first non dinghy vessels to feature a bowsprit. Despite being very light, Greg considered that not being able to run deep angles a significant disadvantage in moderate/sub planning conditions and worked hard on designing a very simple and easy to use pole system that could combine the best of both worlds. The Young 6.5 was launched with unusual “"bull horns"” and this proved to be an outstanding system that in years to come has been copied and adapted into many other vessels around the world. At the time the Young 6.5 was considered something of an oddity – bowsprits were still illegal to race with, yet what was largely unknown about that this design, was that it had been designed as a cruising boat and featured a huge interior volume, layout and facilities that to this day - has never been rivalled in any vessel this size. This design was a hothouse of design features from the twin companionways, retractable outboard motor, full size double berth, galley, toilet, dinette/double berth all in 6.5m." Cheers for that Cbobr , haven't seen that boat for over 20 years one of gregs mates sailed it in Auckland for a few years it's a quick little beast . 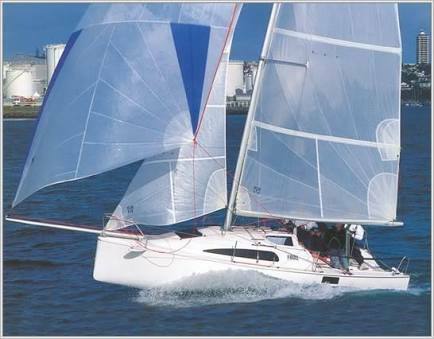 The 7000 is a refined version of raging bull only around 10 were ever built in NZ all GRP Moulded at Greg young marine . there were a few 7.5 m versions built in Australia and quite a good number built in the UK. Seems like all the NZ built boats bar one went to the northern hemisphere and maybe one to Australia ? Actually, I talked to the owner of krazy bull when it was for sale. Peter Reece in Portland Oregon I think. I ended up buying an Elliott 770 instead I talked to Peter about the boat and I think it had been extended by a few feet, had a trailer that was in pretty bad shape, but the price was pretty good. He was advertising it here, actually. KB, a blusail 24, and the Elliott were on my short list, Elliott won out. KB looked pretty good though, just a bit tired. I can't find the pictures he sent. 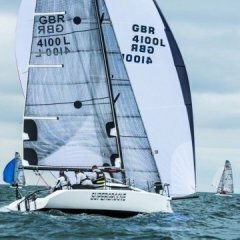 Good choice of boat ryley , we have 3 Elliot 650's and a 7.4 at our club and a 780 arriving in a week or so . the 650's are very quick and have a big weight advantage at 650-700 kg compared to the Bulls 1000kg , the 7.4 is slightly slower especially off the wind as they don't have A sails and it's a full GRP production model so quite weighty . The 780 should be very fast it is well set up and light for its size at 1000kg . i crewed on one of the first 770's in 94 . it was owned by gregs cousin/brother I think . only did the one race but we cleaned up in our division and passed most of the big boats too . Thanks for the info I have messaged peejay quite some time ago to ask where the boat went but haven't heard back . I suspect the info I got had the wrong country of origin . I've done a very thorough search of club race records here in NZ and have only found "raging bull" . But it's not urgent now the fellow club member that wanted to look at krazy bull has bought the Elliot 780 instead . Phantom? I see she's fallen off the trademe listings. Our family sailed it in Waikawa way back when it was young and fresh. She's one of the faster ones, make sure you go out for a ride! That's awesome mate ! I'm helping with the pickup this weekend it will be going past Waikawa on Sunday arvo northbound . There’s a bull 7000 in Lithuania of all places on a lake in Trakai found it there while on business last year, amazed to see one on a relatively small shallow lake. Looks like they sail it to its maximum potential ! Thanks for that link Ronan , hope super groove is going well for you this season ....give em a taste of kiwi ! Would love to put the kiwi hurt on the local fleets but kiwi and IRC are like oil and water they just don’t mix well. Still pelting downwind at crazy speeds make me think who cares about IRC it’s kiwi speed all the way for us!! !..search Facebook ‘supergroove fl technics’ for the latest videos. still would like a blast on a bull 7000 though articulated prod looks cool! !